Chrysler requests that dealers divide showrooms into "brand salons" using kiosks with interactive touch screens, left, and paint and upholstery samples. Chrysler wants all dealers to complete installation by the end of next year. 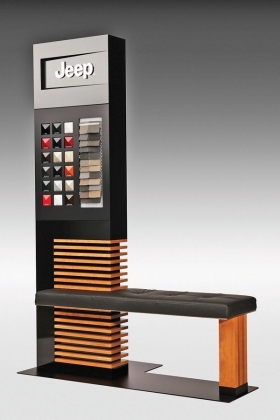 Chrysler Group is asking dealers to dress up showrooms with kiosks, furniture and other items. Cost: $12,334 for small dealerships, up to $55,000 for large ones. Signs: Salons will be delineated by floor- or wall-mounted brand signs. DETROIT -- Chrysler Group wants dealerships to invest up to $55,000 in new furnishings, including electronic kiosks, to showcase each of its brands: Chrysler, Dodge, Jeep and Ram. The company says the installations are voluntary. But dealers who install the "branded salons" will be eligible for extra cash rewards. Dealers will also be asked to invest in other facility improvements later, primarily new exterior signs. Costs for the furnishings vary, depending on the size of the dealership and the amount of equipment installed, the company said. Dealers who buy the equipment before July 31 will get a lower price. A large metro dealership will have two kiosks for each brand -- eight in all -- and wall or ceiling signs. The cost: $55,000 for dealers who sign up before July 31. The price goes up $5,000 after July 31 and up another $5,000 after Aug. 31. One of the kiosks has paint and upholstery samples and an interactive screen on which customers can configure vehicles using software called iShowroom. The second kiosk has a lockable storage case for branded merchandise. Small dealerships do not need the kiosks for each brand. The minimum installation, a single interactive video monitor, would be $12,334 before July 31, according to a memo Chrysler sent to dealers. Chrysler wants metro-area dealers to install the kiosk, signs and equipment by early 2011. Dealers outside metro areas will have until the end of 2011, said Chrysler spokesman Ralph Kisiel. "The idea is to clearly delineate the brands in the showroom so it's not a hodgepodge of vehicles," he said. A dealer who declined to be identified called the installations "overpriced." He questioned whether customers would use an in-store, interactive monitor to configure a vehicle when they could do the same thing on their home computers. But David Kelleher, owner of David Dodge-Chrysler-Jeep in Glen Mills, Pa., and a member of the national dealer council, said the program will help lift consumers' perception of Chrysler. "It enhances my franchise value," he said. Kelleher said the amount of reward money he gets for installing the equipment far exceeds his cost for installing it. The installations are part of Chrysler's Dealer Standards, which the company has been rolling out since Fiat management assumed control last year. Under Dealer Standards, Chrysler pays dealers who earn points based on their facilities and how they take care of customers. The showroom upgrades will be followed by other requests by the automaker for facility changes. New external signs will be unveiled later this summer.